Insulating fire bricks (IFB) belong to the group of thermal insulation bricks. IFB are shaped refractory products with an application temperature of greater 800°C and a total porosity greater than 45%. Insulating fire bricks are classified according to ASTM C155, EN 1094-2, ISO 2245 or JIS R2611. 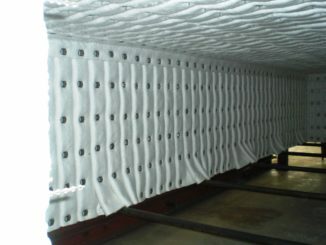 Insulating fire bricks are mainly used in shuttle kilns, tunnel kilns or lab kilns. Further fields of application include heat treatment furnaces as well as petrochemical plants such as reformers/cracker furnaces or combustion chamber linings. Insulating fire bricks are aluminum silicate refractory bricks, silicate bricks or lightweight corundum bricks. The most commonly used refractory bricks are from the group of aluminum silicates. The chemical composition has a direct influence on the classification of the refractory bricks. In general, the higher the alumina content and the firing temperature of the insulating firebrick, the higher its classification temperature. Raw materials based on Al2O3, SiO2 and CaO. CaO is typically used for anorthite refractory bricks. Raw materials are clay, kaolin, kyanite, mullite, (light) chamotte, sillimanite or andalusite. Alumina, alumina hydrate and corundum in the form of hollow sphere corundum are also used for refractory bricks with high classification temperature. The thermal conductivity is defined by the total porosity as well as pore shape and pore size distribution. The porosity is produced by burnout materials and water. Burnout materials are e.g. Sawdust, styrene bubbles, coke or cellulose. Raw materials and burnout materials are optionally mixed dry and/or mixed with water. The amount of water depends on the shaping process. The bricks are formed by casting, slingering, extrusion or dry pressing. For the casting process large molds are used and blocks/hoppers are casted. The casting compounds are processed directly after mixing. Water-binding raw materials extract water from the slurry and support the setting of the green body. The process can be accelerated by adding gypsum or cement. Due to the high water content, the drying of the green compacts takes a correspondingly long time. Light weight bricks with high porosity can be produced this way. In addition, foam or foaming agent can be added to increase the amount of pores. Soap or saponins are used as foams, while metal or carbide powders are used as foaming agents in the processes. The slingering process is a continuous process in which the masses are slingered in large molds or on a conveyor belt. Insulating fire bricks of medium density can be produced this way. Masses which are used for the extrusion process, undergo mulling after mixing. Water-apsorbing raw materials can saturate with water till an uniform moisture is reached in the mixture. The masses are then extruded through a mouthpiece, cut to size and dried. Dry pressing is usually done uniaxial. The pressing method is suitable for the production of bricks with a high density. The shaping process and the porosity agents cause typical structures of the insulating fire bricks. Firing of the refractory bricks is done in shuttle or tunnel kilns. The firing temperature is equal to the specified classification temperature. The refractory bricks shrink during drying as well as during firing. They have to be cut and grinded to final size after firing. The properties of the aluminumsilicate refractory bricks result from the chemical composition, the pore formers/density and the firing temperature. Higher Al2O3 content and higher firing temperature of the firebricks result in higher the classification temperature. Classification temperature is the temperature at which a shaped refractory material is allowed to shrink by a maximum of 2% after 24 hours of firing. The upper application temperature of the materials is usually about 100K below the classification temperature. The thermal conductivity of the final product depends on the chemical composition, density and pore structure. Insulating firebricks with low density and fine pore structure have a low thermal conductivity. The pore structure and density are largely determined by the manufacturing process. Fine burnout materials and a high water content in the process lead to a finer structure of the firebrick. This can be supported by using a foam/foaming agent. However, the density cannot be reduced endless. 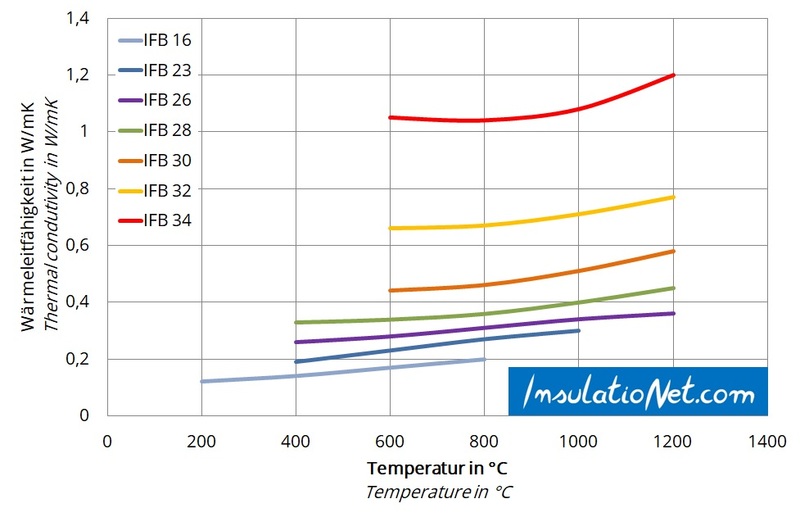 There must be sufficient structure in the green body to dry and burn it crack-free.The diagramm shows typical thermal conductivities of different IFB groups. However, a low density goes ahead with a low strength of the insulating fire brick. The cold compressive strength is specified as a characteristic value. The “hot” properties of the material must be good enough to support walls and arches at the desired application temperature. Hot bending strength or creep under load are characteristic values for the use at high temperatures. Thermal shock resistance limits the heating and cooling rates. This is especially important for periodically operated furnaces as well as operating furnace doors. The measurement of these properties is standardized by the series of standards DIN EN 993 1-18, which are closely based on the corresponding ISO standards. There are different classification options for insulating fire bricks. Most common are ASTM C155 and ISO 2245 / EN 1094-2. Both systems are based on the so-called classification temperature and the bulk density of the material. Refractory bricks are classified into different groups according to ASTM C155. The grouping results from the classification temperature and the density of the insulating fire bricks. Refractory bricks of a certain class may not exceed a defined density and may not exceed a shrinkage of 2% after firing for 24 hours. The test temperature is 30 K below this classification temperature. Example: A insulating fire brick “IFB 23” may not exceed a density of 769 kg/m³ (48 lb/ft²) and must have a shrinkage below 2%, after 24 hours of firing at 1230°C (2250°F) to be classified in group 23. The classification according to ISO 2245 and EN 1094-2 is also based on classification temperature (CT) and density. Shrinkage may not exceed 2% after 24h of firing at classification temperature. 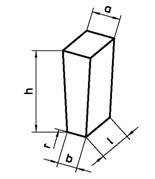 Example: A refractory brick “IFB 110” may not exceed 700 kg/m³ density and must shrink below 2% after firing 24 h at 1100°C to be classified in Group 110. There are also other markings in which the first indication refers to the classification temperature and the second to the density of the insulating fire brick. A refractory brick “IFB 110-12” has a classification temperature of 1100°C and a bulk density of 1200 kg/m³. There are different standard shapes for insulating fire bricks depending on the application. Side arches (H), keys (Q), end arches (G), double end arches (GG) and end arch bonders (GB) are used for arches and round wall shapes. 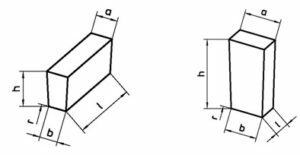 The radius in the table is calcualted for 2 mm joints.